Blend the watermelon in a blender until there are no chunks left.Add the watermelon to a wide pot with the vinegar and bring it up to a boil.Let the purée reduce for 20 to 30 minutes until it has reached a thick ketchup-like consistency.The timing will depend on the size of your pot: if you want to speed it up,try using a Dutch oven or a large,wide skillet.Add in the honey and stir. 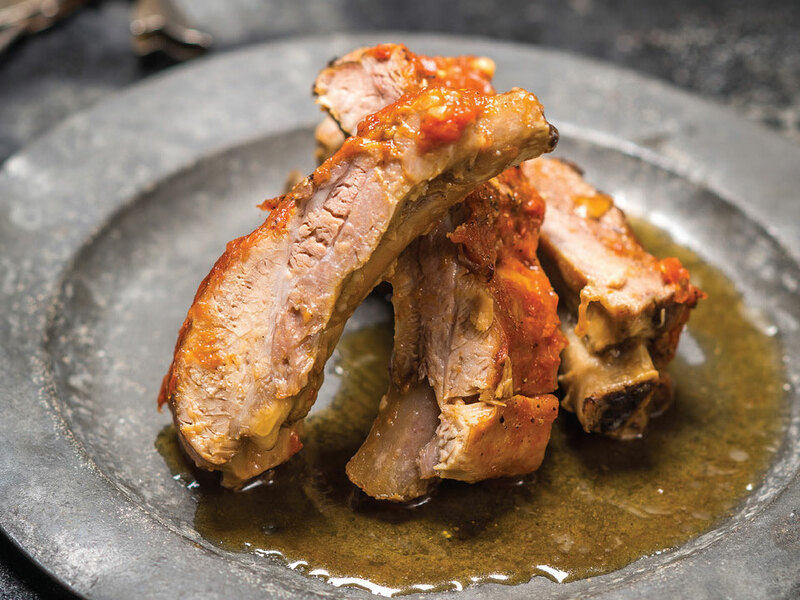 While the sauce is reducing,turn on your broiler.Salt the ribs generously on both sides and place on a wire rack on top of a sheet pan.Put the ribs in the oven under the broiler for 5 to 7 minutes,with the meat side up.Remove once the meat has started to brown and let cool.Reduce the temperature to 300°F. Take the ribs off the rack and set them on a few large sheets of aluminum foil: you're going to wrap the ribs tightly so be generous with the foil.Brush the watermelon sauce on top of the ribs,add another sprinkling of salt and some pepper,and then wrap the ribs in the aluminum foil.Be careful to wrap them well and with a few layers: if the juices start leaking out you can end up with a lot of burned sauce in your pan. Place the wrapped ribs on a sheet pan and put in the oven.Cook them for 2 1/2 to 3 hours (depending on their size and how tender you like them).Remove from the oven,unwrap,and serve. I love cold ribs and these are easily served cold or at room temperature.They can be made a day or two ahead;just store them in the aluminum foil until you are ready to serve them.If you make them ahead and want to serve them hot,you have a couple of options.You can broil the ribs,let cool,and then brush with sauce and wrap in foil,cooking them only before you want to eat.They are easily transported in their foil,still hot.Another alternative is to fully cook them and then reheat them once you arrive.Ribs are very forgiving so you can heat them up without worrying about overcooking them.The biggest thing is not to remove them from the aluminum foil: you never want to lose the sauce,so try to keep it inside until ready to serve,whatever the scenario.